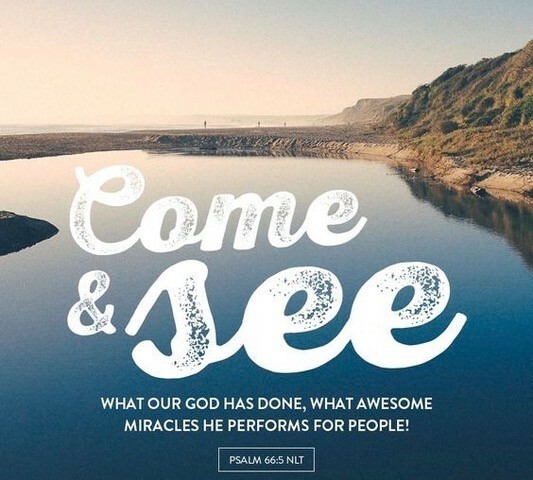 “Come and see!” What a wonderful cry of joy and expectation. More and more as we have the privilege of traveling the nations and hearing the stories of changed lives I want to be part of this “come and see” Easter message in my world today! In Matthew we read the report of the first women who announced the miracle of the resurrection, this amazing gift of new life: (Matthew 28:6) He is not here; he has risen, just as he said. Come and see the place where he lay. In this season God is asking us to come and acknowledge the evidence of this life. In a time when women are speaking out about so many other issues, here is a reminder from these women to remember to come and rehearse the God stories too. God is doing amazing things all across the world. This last month Helen and I have had the joy of travelling in Canada, USA , Hull, London, Cambridge and elsewhere and in every place there has been a “come and see” story. Having been away from the UK for two weeks I sensed such a surprising joy as I put my feet back on English soil. I have such a growing sense of excitement that in the midst of much pain and many challenges God has a plan and is ready to bless our nation. So let us pray and declare this scripture in Psalm 66:5 – Come and see what God has done, his awesome deeds for mankind! I trust you are able to sense this growing hope stirring in your heart too for where you live. I feel this cry – “It is WELL with my soul”. There is an overflow of His goodness. I am privileged to hear the stories of healing and blessing, like babies born after prayer when there was no hope. Like the house sale that was rapidly completed after intentional prayer when all other house sales had been stagnant for months. Like the provision of a long awaited promotion and financial release after a prophetic word. All these stories are part of these “come and see” moments. There are so many – like the little boy who had troubled sleep and is now sleeping all through the night without nightmares. The story of a teenage girl who suffered with panic attacks and had become withdrawn but is now able to attend school and church and be in public places and enjoy it…so many stories of life. So as you celebrate this Easter I trust you will share your own “come and see” stories and enjoy Jesus and His incredible gift of life. For the Heartcry Team, April will be a month of missions: Gill and Paul Trevor will be joining a team from the King’s School in the UK who will be serving a church in Balti, Moldova, and doing outreach into schools and youth groups using a range of creative gifts. It is a joy and privilege to be given access into the school and we are excited for what will develop out of this in the months to come. Helen and I will be traveling to Slovenia where this year’s Daughter of the King women’s conference will be held. Please pray for us as we invest into the lives of precious women from the Balkan nations and speak on the theme of “Courageous”. All of the work we do in Europe is missionary in nature, meaning that Heartcry makes no financial demand – we simply go to serve. We appreciate those of you who are able to partner with us financially as we touch some of these poorest communities of Europe – thank you for your generosity. If you would like to support us financially, you can do so by donating online through our website (https://heartcryforchange.com/support-us/), by requesting our BACS details or by sending us a cheque made payable to Heartcry Ministries. Gift Aided donations enable us to reclaim the tax on your gift in the UK too! Thank you for all your investment and prayer support. Happy Easter!